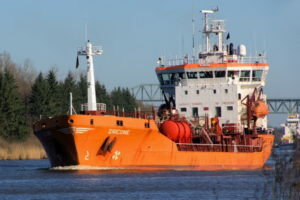 Fire broke out in engine room of product tanker Zircone in the Gulf of Riga. The accident occurred shortly after vessel left port of Riga in Latvia with cargo of 7,000 tons of diesel oil. The short circuit in engine room caused flames, which engulfed the whole compartment. Following the fire, the tanker remain adrift without propulsion power. The crew started firefighting in attempt to rescue the ship and extinguish the flames. The Master did not requested evacuation of the crew and after half day the flames were put under control. The disabled vessel was towed back to Riga Shipyard for further repairs and special survey. The local authorities will follow investigation for the source of the fire. Fortunately during the accident there were no injured people and no water pollution. The troubled tanker was under monitoring by the local authorities and tugs and Coast Guard patrol boats were sent at the scene. The product tanker Zircone (IMO: 9010929) has overall length of 124.86 m, moulded beam of 17.40 m and maximum draft of 5.00 m. The deadweight of the vessel is 8,000 DWT and the gross tonnage is 5,045 GRT. The tanker was built in 1993 by Fincantieri La Spezia shipyard in Italy. During the accident the ship was en route from Latvia to Denmark.